Organised by COOS (Church of Our Saviour), FLM (Family Life Ministry) for Married Couples. As long as you are married, you qualify to attend The Marriage Weekend as a couple. Whatever your culture is, it does not disqualify you. Members of other churches, or religions are encouraged to apply. Teachings on staying POSITIVE, PURPOSEFUL, PRACTICAL and POWERFUL in your marriage. Testimonies of Married Couples on challenges and breakthroughs. Mingling with other married couples to share experiences. Make new friends whom you can share and learn and lean on during difficult times, that may relate to family, children, marriage, in-laws, work, etc. Q. What time do we meet at Ferry Terminal on Day 1? A. Around 7.30am. More details will be given during departure briefing. Q. Will we have time to tour Batam? A. Yes, ee have some time for shopping on the first day, followed by Seafood dinner. The purpose of the retreat is to allow married couples to spend time together and the programs are designed for couples to bond together. Q. What is the program all about? A. We have Pastor Michael Ross Watson to share the 4 Ps in Marriage. We will have time for group discussion on the message, share with other couples our victories and challenges in our marriages and by doing so, we learn from one another. Q. Is the retreat for young couples or mature/senior couples? We have been married for 50 years. We don't want to be the odd one out. A. 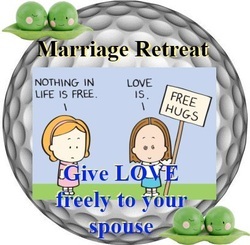 The retreat is for anyone married and with a desire to want to take time to rekindle their marriages. Age is not a consideration. It is about YOUR marriage! Q. Is this retreat open to COOS members only? A. No. You are strongly encouraged to invite your married couple friends to attend. All application must be made through the registration form with full payment. Q. Is $450 per couple for 3D2N worth the investment? A. Definitely yes because you will be entering into a beach paradise with lots of facilities in the hotel(including 10 lane bowling alley, hair & manicure salon, gym etc) with all meals provided, fun games and importantly great spiritual food that will last you a lifetime. Q. What time do we return on the last day? A. Should reach Singapore around 4pm. More details will be given during departure briefing. Q. How long is the ferry journey? Q. Is the ferry safe to travel on? A. Absolutely yes, very stable and is suitable for pregnant wives but it may still be advisable to equip yourselves with motion sickness pills. Q. How limited are the places? A. We are targeting for at least 50 couples and registration will close as soon as the 50 places are taken up. So, sign up early.